This month we celebrate with the universal Church the canonization of St. Kateri Tekakwitha - the first Native American saint. In this teachable moment, we also share our Community's history with this newly-named saint in regard to a statue we've had of her since 1940. We hope that people can come to our Convent property to see the beautiful statue and that her story will be inspirational. Kateri Tekakwitha was born to Tagoskouita, a baptized Roman Catholic Algonquin woman, and Kenneronkwa, a non-Christian Mohawk Chief, in the Mohawk fortified village of Canaouaga or Ossernenon – near present-day Auriesville, NY along the Hudson River - in 1656. For more information, click on this link. In the mid 1930s while being aware of the story of Kateri Tekakwitha, Mother Magdalene Wiedlocher, Provincial Superior of the Hospital Sisters of St. Francis, wanted to bring a deeper awareness of and a devotion to Kateri among the Sisters in the American Province. She pursued the commission of a Kateri statue with Daprato Statuary Co, Chicago and at this same time, plans were underway to create the Lake of Our Lady, north of the St. Francis Convent buildings. She decided that this natural setting would make an appropriate place for the Kateri statue. She communicated with Father Thomas Grassmann, O.F.M. Cap., Tekakwitha Friary (Fonda, NY), Arthur Parker, director of Rochester Museum of Arts and Sciences (Edgerton Park, Rochester, NY), and Father John Wynne, SJ, Tekakwitha League (New York, NY), to authenticate the design. Kateri would be depicted wearing deer skin and cloth – a coat-like waist tunic hanging from the shoulders above a deer-skin skirt. In addition, it was suggested she wear moccasins made of leather and laced at the front with deerskin laces. Her hair should be braided in two long braids which are brought forward over her shoulders – a sign of a woman before marriage. A month later, Mother Magdalene wrote to her sister, Mrs. Claire (Wiedlocher) Griffin, who agreed to donate funds for the statue. She assured her sister that the gift would be acknowledged with a memorial plaque at the base of the statue. On July 29, 1940, the white Carrara marble statue was unveiled in a grotto on the east side of the St. Francis Convent’s Lake of Our Lady. The plaque was inscribed: In loving memory of Claire Griffin & her son, James 1939. A few years later, January 3, 1943, Pope Pius XII proclaimed Kateri venerable. Years passed by but the cause for sainthood of Kateri was not forgotten and on June 22, 1980, Pope John Paul II proclaimed Kateri Tekakwitha blessed. 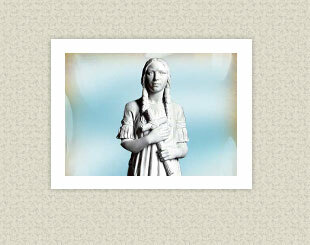 On February 18, 2012, Pope Benedict XVI announced that Blessed Kateri would be canonized later in the year. That same month, the Kateri statue was removed from its original location and over the next months was restored by Tom Cunningham, Hospital Sisters of St. Francis employee. Upon inspection, the 72-year-old marble statue had been painted as a protective measure and once the paint was removed, the statue was found to be discolored and stained—all due to weather conditions over the years. A solution of hydrogen peroxide and baking soda was applied to the statue over a 48 hour period and this process was repeated eight times until the stains were removed. The statue was then buffed and polished—returning it to its original beauty. On October 14, 2012, the statue was rededicated on the east side of the St. Francis Convent property - near the Chiara Center entrance. The cross, displayed behind the statue, was created from Ash tree wood taken from a tree on the St. Francis Convent property. With the canonization of St. Kateri Tekakwitha on October 21, 2012 at St. Peter’s Basilica, Vatican City, she becomes the first Native American saint. We invite visitors to see our beautiful statue. Please call our Chiara Center at 217-523-0901 or e-mail us for information.